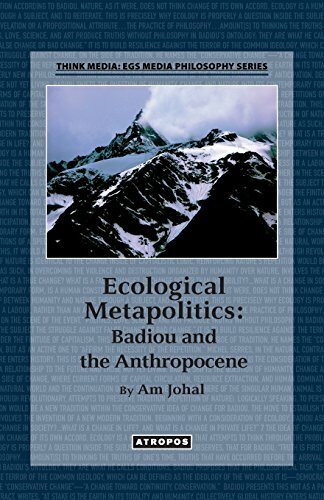 Ecological Metapolitics, for the first time, attempts to realize a synthesis between the problem of ecology and some fundamental concepts of Alain Badiou's proper philosophy. Ecology cannot be the first problem. Drawing from Badiou's work in Ethics, Metapolitics, Manifesto for Philosophy, Being and Event and others, Ecological Metapolitics attempts to consider the possibility of a new, modern tradition emanating from the Event, in light of the ecological question today. The book considers death, mourning, democratic materialism, the passion for the real, resistance and technological fixes such as geo-engineering. Ecological Metapolitics ultimately serves as a critique of environmental ethics, argued through Badiou's philosophical work.